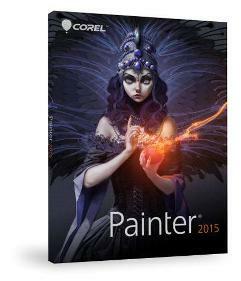 Corel Painter 2015 is the ultimate digital art studio for anyone ready to expand their definition of creativity. Corel Painter 2015 is a combination of inventive drawing tools, Natural Media brushes, image cloning capabilities and virtually unlimited customization options give you total freedom for creative expression. Internationally recognized for its RealBristle brushes, Corel Painter 2015 offers the most realistic form of digital painting available in the digital art realm. Corel Painter 2015 is changing what’s possible in art. Explore new creative possibilities with Natural-Media brushes, paper textures and media that look and feel just like traditional art materials. Find unreal inspiration with revolutionary new Particle Brushes and mobile enhancements. Experience the speed and power of the ultimate paint program with native 64-bit Mac and PC support. Plus, work with Photoshop files for even more creative compatibility. By adding Corel Painter 2015 to your workflow, you gain a full art studio that gives you the tools to create unprecedented artwork. Digital art tools let you experiment with color theory, composition and brush strokes, without the toxins, mess and expenses associated with traditional art. Discover incredible brushes that let you revel in creative chaos or take complete control. Enhance a photo-clone painting or create a unique masterpiece with physics-based brushstrokes that spring, flow, glow and gravitate onto your canvas. Performance improvements for your Mac mean faster speeds when it comes to intensive operations. Zoom, rotate, transform, work with layers and more – all without slowing down. Plus, experience improvements to brush accuracy and performance. Paint on the go and find new inspiration anytime, anywhere. Plus, use the Painter Mobile for Android app and then import your work directly into Corel Painter 2015 to add the professional finishing touches. Now utilizing half the power of previous versions, your laptop battery will last longer while using Painter. Experience brushes that on average now offer 40% more speed, with some brushes clocking in at 6x faster than previous versions! Inspired by professional Painter artists, these timesaving arrangements include new Brushes, Illustration, Cloning and Minimal UI options that allow you to easily switch between tools and optimize your painting environment. Enhance the realism and randomness of your digital brushes. Add Jitter Smoothing to Airbrush spacing and flow, brush rotation, color expression and more – all while using both old favorites and brand new Particle Brushes. Add effects to your work and see them displayed on your canvas in real-time as they’re applied. Now your entire canvas offers a world of effects experimentation – all completely in real-time. Discover even more creative possibilities with new paper textures, nozzles, images and more. Plus, discover all-new Toolbox icon updates that match the fresh new look and feel of Corel Painter 2015. Discover why RealBristle technology replicates traditional art materials more realistically than any other software. Control color intensity and shading simply by adjusting the angle and pressure of the pen on your tablet. Transform photos into paintings using the powerful cloning and photo-painting tools of Corel Painter 2015. Clone images by hand or let the Auto-Painting palette paint a photo for you using your choice of brush and media. The SmartStroke brush technology follows lines and contours in your picture just like a real artist would. Painter 2015 Hot Fix 1 will fix a known issue with Painter 2015 when using tablets and Microsoft .NET Framework 4.5.2. After the Hot Fix is applied Painter 2015 will launch with a tablet connected to your computer and Microsoft .NET Framework 4.5.2 installed on the system.